Deaths of tribal children in ‘Adivasi Ashram shala’ questioned the administration of Maharashtra on the protection of children. Maharashtra state has designed schemes based on the central policy to ensure infrastructural facilities in the residential school set-up. Whereas, analysis of the death report reveals the primary cause for death is infrastructural mismanagement. 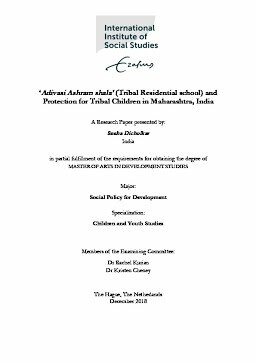 Therefore, this study particularly addresses the paradox- despite many schemes, programs, and legal frameworks are introduced by policymakers at the central and state level to ensure the protection of children. Children’s status on the ground reveals an alarming situation of deprivation. To understand the paradox, this study looks into stakeholder’s understanding and interpretation about the policy and the circle of implementation. To address the paradox, the study reveals that the central government has put the entire responsibility on the state to implement the scheme as per the need of the region. In absence of guideline from the central government to run and monitor the scheme, the state has made it more bureaucratic. My study reveals that due to school’s remote establishments; street-level bureaucrats are implementing it according to their own solace and beliefs. This interrelated circle is making children more vulnerable to their physical safety and security.